More than the ‘breakthrough’ on nuclear liability and their personal chemistry, Prime Minister Narendra Modi and US President Barack Obama’s summit will be remembered for the fateful decision India took to join hands with the United States against China. In diplomacy, big shifts are often conveyed through words that are written, not spoken. The American policy of containment against the Soviet Union emerged from a long cable. India’s decision to support that policy’s modern variant — this time with China as the object — is writ large in the ‘US-India Joint Strategic Vision for the Asia-Pacific and Indian Ocean Region’ statement issued on January 25. Unprecedented in form and content, the document declares that “a closer partnership between the US and India is indispensable to promoting peace, prosperity and stability” in the region. Prosperity, in turn, “depends on security,” the statement says, mentioning in this context not Somalia and piracy, the Persian Gulf or the Malacca Straits but one and only hotspot: A maritime dispute involving China. To realise the significance of this reference to the South China Sea, we need only cast our mind back to June 1998, when Bill Clinton and his Chinese counterpart, Jiang Zemin, issued a ‘Sino-US Presidential Joint Statement on South Asia’. The context was the nuclear tests by India and Pakistan but New Delhi bristled at its meddlesome language. The “Asian powers” referred to are Australia and Japan, of course, a fact confirmed by US officials in a background briefing to the New York Times. 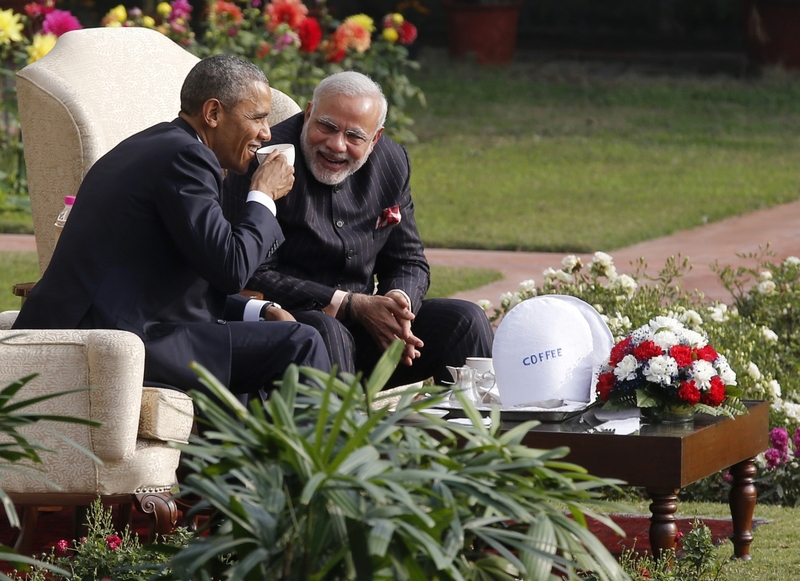 According to these officials, the first 45 minutes of the Modi-Obama meeting was dominated by China. Modi, they revealed, “suggested reviving a loose security network involving the US, India, Japan and Australia.” The last time this quadrilateral was convened — way back in 2006 — India’s reluctance to get sucked in to an emerging Cold War in Asia led it to insist on limiting its interaction to one naval exercise and to junior official level meetings at the sidelines of larger Asean gatherings. The Quad was unceremoniously dissolved when Kevin Rudd became Australia’s prime minister. Few tears were shed in Delhi at its timely demise. What we are seeing now is Modi committing India to work closely with the US, Japan and Australia in order to counter the challenges China poses to them. By any yardstick, this represents a major shift in Indian foreign policy. Indians exulted by the prospect of bandwagoning with the US against China ought to realise the pitfalls of a strategic partnership that is, in large measure, a function of the state of relations between China and the US. The plateau which India and the US hit after 2009 was not so much a function of nuclear liability or other economic issues but of India’s lower salience in America’s global and regional strategic calculus. The US turn against China began towards the end of Obama’s first term. India nevertheless chose to maintain its strategic autonomy. By keeping its distance from the emerging fault line between the US and its alliance system, and China, India was trying to ensure its relationships with Washington and Beijing would not end up as a zero-sum game. Modi is taking India into a situation where a non-zero sum outcome will be increasingly unlikely. Even if he was playing a game of poker, humouring Obama merely in order to get the Chinese to offer India better terms, the leaks from the US side will make it difficult to play that hand. The same thing happened in 1998, when Clinton released Atal Bihari Vajpayee’s secret letter in which he said India had tested nuclear weapons only because of China. In recent years, China has rattled India by the stridency of its border claims but India has to deal with this challenge on its own. The Ladakh incursion during Xi Jinping’s visit to India was a grave provocation but when Modi took sides with Tokyo in its maritime dispute with Beijing by calling China an “expansionist power” and “encroacher” on the seas of others, did he think he was deterring Chinese incursions into India? Did he think Japan and the US would take sides in India’s territorial dispute? Was last year’s India-US reference to the South China Sea a credible message that India was capable of following through, or an invitation for Beijing to send a submarine to Sri Lanka? India can and must strengthen ties with China’s neighbours like Vietnam and Japan, as well as rising East Asian powers like Indonesia and South Korea. But associating itself too closely with the US and its alliance system represents the opening of a qualitatively more dangerous front. One in which the risks outweigh the benefits. This entry was posted on January 29, 2015 by Siddharth Varadarajan in China, Indian Foreign Policy, U.S. Policy in South Asia.